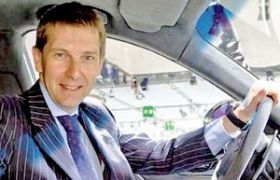 Simon Sproule, 45, spent more than 20 years at Nissan and Ford as well as a stint at Microsoft before joining Tesla. Aston Martin, the British sports car brand, said today it hired Simon Sproule, the vice president of communications at Tesla Motors, to serve as chief marketing officer under new CEO Andy Palmer. Sproule’s move, first reported Monday by The Wall Street Journal, reunites the two Britons, who had worked together at Nissan before Sproule left to join Tesla. Until early 2014, Sproule had been chief spokesman for Nissan CEO Carlos Ghosn, while Palmer, 51, who left the company last month to lead Aston Martin, was Nissan’s chief planning officer. Aston Martin is best known for its association with the James Bond spy films. It sells a range of luxury coupes, sedans and convertibles that begin at $102,725, including shipping, for the U.S.-bound 2015 V8 Vantage GT. Sproule, 45, could not be reached to comment. He will lead the global marketing and communication activities for Aston Martin, the UK sports car maker said in a statement. He will report to Palmer and will be based at the company’s headquarters at Gaydon, England. Sproule starts his new post on Nov. 1. Sproule’s departure presents a challenge to Tesla, which is just months away from supplementing its Model S sedan by launching the all-electric Model X crossover. Tesla’s hiring of Sproule, in April, had been seen as a sign of growing maturity for a company that for the past several years had lacked stability in its communications department. Before his arrival, many of Tesla’s major announcements had been made personally by CEO Elon Musk through postings on Twitter or the company’s official blog. Last week Musk tweeted about a possible new product announcement coming up on Oct. 9. Aston Martin has not had a senior level marketing executive since Michael van der Sande left his job as chief commercial officer last year to become head of marketing for Renault. Like Sproule, van der Sande joined Aston Martin from Tesla, where he had been senior vice president for sales, marketing and service before leaving in 2009. Aston also announced today that brand communications director Janette Green would take on the role of director of Palmer's office.